Biblyon Broadsheet: Do not miss Petty Gods! Reviews related to role-playing games, with a focus on Gods & Monsters, and a bit of superhero gaming. 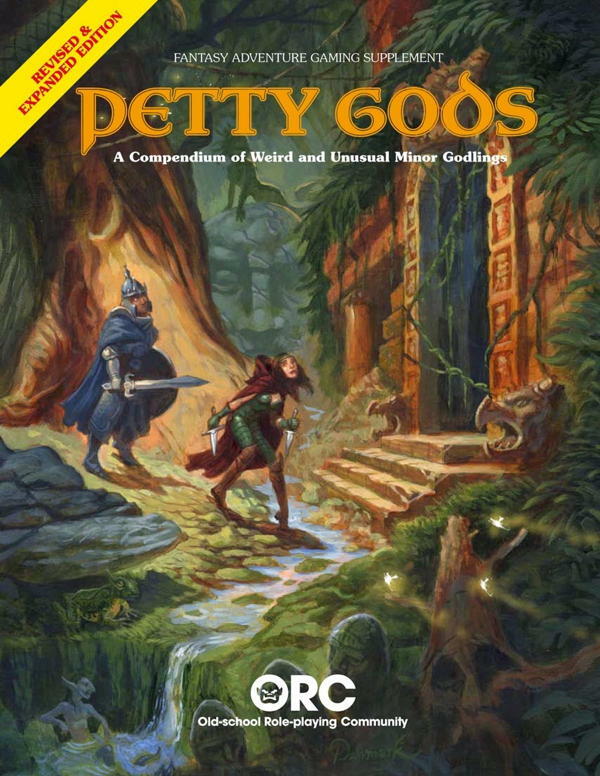 Do not miss Petty Gods! Although Petty Gods was written for Labyrinth Lord and BX, if you are playing a game called Gods & Monsters you presumably want a lot of gods in your game. This book is therefore a great companion, not surprisingly, for Gods & Monsters, which is mostly compatible with BX anyway. If you are looking to fill your Gods & Monsters game with approachable deities, you’ll find more than your fill in the 206 pages of lesser gods here. They are what the Adventure Guide’s Handbook calls demigods, spirit gods, and heroes. You can easily populate your game with a new god for every adventure if you wish, without fear of overcomplicating your world any more than providing a unique monster for every adventure. Speaking of unique monsters, there are 66 pages of “minions, knights, & servitors” that puts many dedicated monster books to shame. Add in several pages of cults, divine items, and spells and this book plus your regular GM workload should turn your brain to tapioca in less than a month. That is, if you were to read the whole thing all at once, which, as dedicated gamers know, is something you never do to a tome as thick and dangerous as this. The spells are mostly very appropriate for Gods & Monsters spirit manifestations—that is, they are very divine and not so much magical. Alignments in Petty Gods are designed for Basic/Expert’s Lawful/Neutral/Chaotic single axis, so you’ll need to set your own alignments for the dual axis in Gods & Monsters. The book’s old-school bonafides are provided by both old and modern old-school stars: a prologue by Jennell Jaquays1 and a foreword by James M. Ward2; and an appendix by Tekumel’s M.A.R. Barker. Michael Curtis provides one of the appendixes, and Richard J. LeBlanc, Jr. provided the bulk of the editing. It’s a very clean production. The typos, while numerous, are more of the missing article variety, or doubled thought and occasional real-word misspelling.3 I don’t recall seeing any that change the meaning. There does seem to be some missing text in M.A.R. Barker’s Create a religion in your spare time for fun and profit. It may just be a wrapped Ouroboros paragraph, however. This appendix is particularly poorly edited4, but still a fascinating and thought-provoking source of ideas for fantasy deities. It is written very much in the Gygaxian style. He does seem to have a problem with the notion that good and evil (let alone order and chaos) can have an existence beyond the petty rationalizations of men. Or that gods can have an existence beyond the minds of men, for that matter. While his gods when he talks about creating them have the power to smite, when Barker switches to moral relativism his Might Jugbo defers to his minions in just about everything. In fact, his checklist for creating a religion is to look at the inhabitants and their culture, and decide what gods they might create. And that’s fine, but it makes an assumption that isn’t necessarily true in a world where gods are real. In such a world, it makes just as much sense to start with the gods and then create the culture they would create. That is what this book is eminently suited for. That’s not the only appendix: there’s also one on real gods for Barsoom, a very detailed Legends & Lore of the Jale God, and a collection of silly and serious Petty Foods of the Petty Gods. And there’s also a pretty-much all silly Petty Classifieds. The artwork is uniformly good throughout and often very good. Thomas Denmark’s cover illo is breathtakingly inspirational. All in all, and even in its parts, I can’t recommend Petty Gods enough. And if you find Gods & Monsters at all useful, you will find Petty Gods a great sourcebook for divine encounters. At its current price of $13.22 on Lulu.com, this is an incredible steal. It is a tome worthy of any old-school shelf. Who, as Paul Jaquays, wrote some of the absolute best old-school adventures, including Caverns of Thracia, and was also the guiding force behind the direct inspiration for Petty Gods, the Judges Guild supplement The Unknown Gods. Of Metamorphosis Alpha fame, and, more to the point here, Gods, Demigods, & Heroes and Deities & Demigods. Google of the Frog God instead of Goggle of the Frog God, for example. Particularly annoying, unless I’m missing something about Barker’s writing style, is a near-100% search-and-replace on “mighty” to “might” resulting in a lot of talk about “might wizards” and “Might Jugbo” (an example deity). Weave fantasy stories around characters that you and your friends create. As a Gods & Monsters Adventure Guide you will present a fantastic world to your players’ characters: all of its great cities, lost ruins, deep forests, and horrendous creatures. Save vs. Dragon: Richard J. LeBlanc, Jr. The Judges Guild module Caverns of Thracia is one of the classics of the old-school. It’s also eminently reskinnable by changing the names of gods and expanding on some of the magic items hidden inside. Over the last few weeks I’ve run across several free compendiums: monsters, gods, and simple dungeons. Space Age Sorcery, Petty Gods, Lord Gwydion’s Beast of the Week Collection, Varlets and Vermin, and the 2013 One Page Dungeon Contest. Random tables can make your design process faster when you’re thinking too hard about inconsequential things; it can also make running a game faster when players ask questions you didn’t anticipate in places you didn’t imagine. Bill Owen, one of the early members/employees of Judges Guild, has created an amazing color collection of old Judges Guild artifacts: maps, designs, and more from the early days of JG. Revised Lost Castle of the Astronomers in print! I’ve just re-opened my Lulu store with a 9x7 Lost Castle of the Astronomers. The best superhero game of the old-school, and possibly still, V&V is an easy game to read and play. An amazing new resource for old school games—and that includes Gods & Monsters. Figuring out stuff from “the times before” is hard to do. Since I first made Gods & Monsters public over ten years ago, there’s been a groundswell of support for “old-school” D&D games. Since Gods & Monsters is compatible with adventures for original D&D and AD&D, it’s also compatible with adventures for most of these new games. Fight On! issue 7 is out; look for a Gods and Monsters adventure inside. James Raggi is producing some great stuff, easily usable with Gods & Monsters. The undiscovered comment form, whose bourn no poster returns. Your email, URL, and location are optional—but I won’t be able to contact you if you don’t leave a working email. Your email does not get displayed, your URL and location do. Your name is required but may vary as the needs of the day demand, or you can just use the anonymous Will Stratford name. You can use the following tags: <em>, <a>, <blockquote>. Use them wisely and post intelligently. Comments may take some time to approve, especially if I’m on a three-day gaming bender. Contents of The Biblyon Broadsheet™ as a whole Copyright © 1994-2019 Jerry Stratton. Individual copyrights remain held by their respective authors unless they specify otherwise. Site titles, such as Negative Space, Strange Bedfellows, Biblyon Broadsheet, Highland Games, and FireBlade Coffeehouse are trademarks of Jerry Stratton. Do not miss Petty Gods! last modified June 26th, 2015.